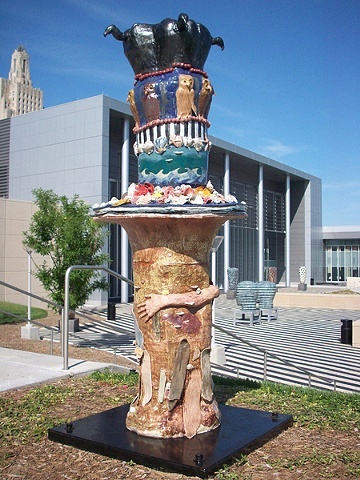 This piece was installed on 16th and Central in Kansas City MO. It was part of the Avenue of the Arts project. There are many ways to approach the sculpture. It stands tall like a totem, and attempts to recreate nature, it simulates shrines, and has many different early civilization influences. As the vultures tower over the viewer a collection of small skulls and bright colorful flowers rest at their level. This may cause the viewer to feel smaller and be reminded of how we sometimes overestimate our power and presence on this planet. I would like my viewers to be reminded of not only their own mortality but also the earths and our relationship to it.